Donald trump’s nerve-jangling presidential term began its second half with a federal-government shut down, seesawing markets and the ejection of reassuring cabinet members like Generals John Kelly and James Mattis. As Mr Trump’s opponents called this a disaster, his supporters lambasted their criticism as hysterical—wasn’t everybody saying a year ago that it was sinister to have so many generals in the cabinet? A calm assessment of the Trump era requires those who admire America to unplug themselves from the news cycle for a minute. As the next phase of the president’s four-year term begins, three questions need answering. How bad is it really? How bad could it get? And how should Americans, and foreign governments, prepare for the Trump Show’s second season? Mr Trump is so polarising that his critics brush off anything that might count as an achievement. Shortly before Christmas he signed a useful, bipartisan criminal-justice reform into law. Some of the regulatory changes to schools and companies have been helpful. In foreign affairs the attempt to change the terms of America’s economic relations with China is welcome, too. But any orthodox Republican president enjoying the backing of both houses of Congress might have achieved as much—or more. What marks out Mr Trump’s first two years is his irrepressible instinct to act as a wrecker. His destructive tactics were supposed to topple a self-serving Washington elite, but the president’s bullying, lying and sleaze have filled the swamp faster than it has drained. Where he has been at his most Trumpish—on immigration, North Korea, nato—the knocking down has yet to lead to much renewal. Mr Trump came to office with a mandate to rewrite America’s immigration rules and make them merit-based, as in Canada. Yet because he and his staff are ham-fisted with Congress, that chance is now gone. Kim Jong Un still has his weapons programme and, having conceded nothing, now demands a reward from America. Europeans may pay more into their defence budgets at the president’s urging. But America has spent half a century and billions of dollars building its relations with Europe. In just two years Mr Trump has taken a sledgehammer to them. The next two years could be worse. For a start, Mr Trump’s luck may be about to turn. In the first half of his term he has been fortunate. He was not faced by any shock of the sort his two predecessors had to deal with: 9/11, Afghanistan, Iraq, the financial crisis, Syria. Electoral triumph, a roaring economy and surging financial markets gave him an air of invulnerability. Even without a shock, the weather has changed. Although the economy is still fairly strong, the sugar-high from the tax cut is fading and growth is slowing in China and Europe. Markets, which Mr Trump heralds as a proxy for economic success, are volatile (see article). Republicans were trounced in the House in the mid-terms. The new Democratic majority will investigate the president’s conduct, and at some point Robert Mueller, the special counsel, will complete his report on links between Russia and the Trump campaign. Over the past two years, Mr Trump has shown that he reacts to any adversity by lashing out without regard to the consequences. Neither the magnitude nor target of his response need bear on the provocation. In the past few weeks he has announced troop withdrawals from Syria and Afghanistan. Seemingly, this was partly because he was being criticised by pundits for failing to build a southern border-wall. The Afghanistan withdrawal was later walked back and the Syrian one blurred, with the result that nobody can say what America’s policy is (though the harm will remain). Now that his cabinet has lost its steadying generals, expect even more such destructive ambiguity. Moreover, when Mr Trump acts, he does not recognise boundaries, legal or ethical. He has already been implicated in two felonies and several of his former advisers are in or heading for prison. As his troubles mount, he will become less bound by institutional machinery. If Mr Mueller indicts a member of Mr Trump’s family, the president may instruct his attorney-general to end the whole thing and then make egregious use of his pardon powers. House Democrats might unearth documents suggesting that the Trump Organisation was used to launder Russian money. What then? Confusion, chaos and norm-breaking are how Mr Trump operates. If the federal government really were a business, the turnover of senior jobs in the White House would have investors dumping the stock. Mr Trump’s interventions often accomplish the opposite of what he intends. His criticism of the Federal Reserve chairman, Jerome Powell, for being too hawkish will, if anything, only make an independent-minded Fed more hawkish still. His own negotiators fear that he might undermine them if the mood takes him. Most of the senior staff who have left the administration have said that he is selfabsorbed, distracted and ill-informed. He demands absolute loyalty and, when he gets it, offers none in return. How should Congress and the world prepare for what is coming? Foreign allies should engage and hedge; work with Mr Trump when they can, but have a plan B in case he lets them down. Democrats in control of the House have a fine line to tread. Some are calling for Mr Trump to be impeached but, as of now, the Republican-controlled Senate will not convict him. As things stand, it would be better if the verdict comes at the ballot box. Instead, they must hold him to account, but not play into his desire that they serve as props in his permanent campaign. Many Republicans in the Senate find themselves in a now familiar dilemma. Speak out and risk losing their seats in a primary; stay silent and risk losing their party and their consciences. More should follow Mitt Romney, who marked his arrival in the Senate this week by criticising Mr Trump’s conduct. His return to politics is welcome, as is the vibrant opposition to Mr Trump by activists and civil society evident in the mid-terms. 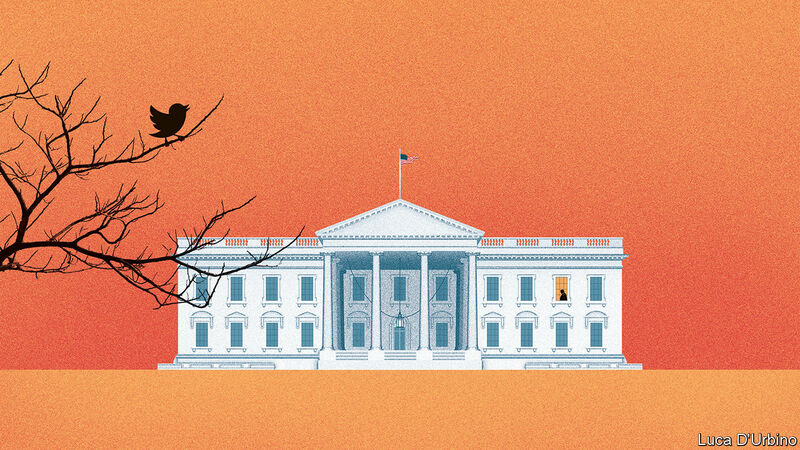 Assailed by his presidency, American democracy is fighting back. After two chaotic years, it is clear that the Trump Show is something to be endured. Perhaps the luck will hold and America and the world will muddle through. But luck is a slender hope on which to build prosperity and peace. 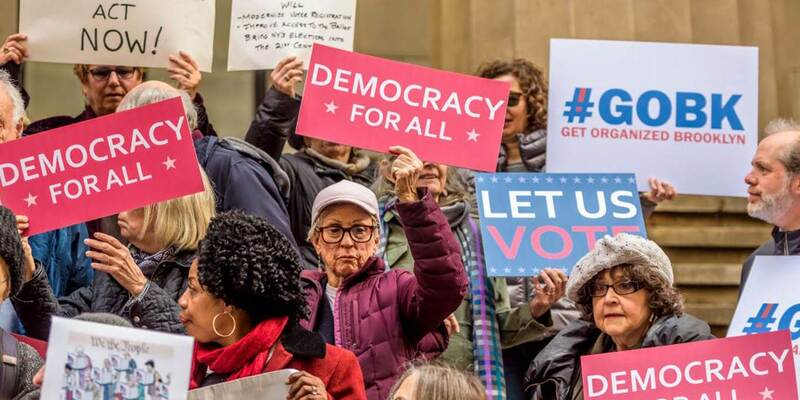 While media coverage since the 2018 US midterm elections has focused squarely on Donald Trump, a growing movement of citizens and activists from across the political spectrum is thinking more broadly about the future of American democracy. And progressive political reforms have been winning support in some unexpected places. BERKELEY – In last November’s US midterm elections, voters sent a clear message about the concerns weighing on their minds and the values they hold most dear. Not only was this midterm cycle the most expensive on record – owing to unprecedented fundraising gains by Democratic candidates – but voter turnout was the highest in at least 50 years, rivaling the turnout for presidential elections. Propelled by fundraising and turnout, Democrats won 40 seats and reclaimed control of the House of Representatives, hitting Republicans with the biggest midterm losses since 1974, three months after President Richard Nixon resigned. Notably, Latino turnout was up significantly, and there will now be a record-high 42 Latino members of Congress. It was also an historic year for female candidates; the next Congress will include 126 female lawmakers – the largest cohort ever. Clearly, President Donald Trump’s behavior in office helped energize female and Latino Democratic candidacies last year. But Trump also amplified voter turnout on the Republican side, by actively campaigning for the party’s candidates. The Republicans’ losses in the House have thus been widely interpreted as a repudiation of Trump and his policies. Since the election, the media’s attention has largely been focused on what the outcome means for the 2020 presidential election cycle, which is already underway. But the story of the 2018 midterms is about more than Trump and the future of his presidency. It is about an American electorate yearning for democratic reforms. Like in the Progressive era of the early twentieth century, when citizens and states spearheaded a wave of measures to improve democratic governance, voters from both parties used the election to signal their support for democracy. More than two-thirds of US voters live in states that allow ballot initiatives, a reform tool that was introduced by the Progressive movement more than 100 years ago. And in 2018, voters in 17 states voted on more than two dozen ballot measures that were designed to make government more representative and responsive. In fact, the number of democratic reform measures on the ballot last year reached a new record. One important type of democratic reform focuses on the problem of partisan gerrymandering. In 2018, large majorities supported redistricting reforms in Colorado, Michigan, Missouri, Ohio (in a ballot initiative this past May), and Utah (by a slim margin). With the exception of Colorado, Trump won all of these states in 2016. Moreover, reforms to expand and protect voting rights also won popular support in four states last year. For example, in Florida, which had some of the closest statewide races in the country, an historic measure to restore voting rights to citizens with past felony convictions passed by a two-to-one margin. In Michigan, where voters were evenly divided on gubernatorial and US Senate candidates, 65% of the electorate supported an initiative to introduce same-day voter registration and other pro-democracy measures. And a similar initiative passed handily in Nevada, too. Meanwhile, eight states and the District of Columbia already allowed for automatic registration in last year’s election, resulting in big voter-registration gains overall. And Maine became the first state to use ranked-choice voting in congressional elections. Voters in several states also made clear that they want more ethical and accountable governance. Missouri voters, for example, passed a package of ethics reforms tightening campaign-finance restrictions for state lawmakers. New Mexico established an ethics commission to investigate allegations of misconduct by state officials, candidates, and lobbyists. North Dakota did likewise, and also approved a ban on foreign political contributions and a new requirement that campaign-finance information be made publicly available. And New York City strengthened its public election-financing program. The New York Times columnist David Brooks is telling a similar story from the right, and spearheading a new Aspen Institute initiative to build on the lessons of strong local communities. And the media company NationSwell is producing a daily feed of stories about successful government innovations from around the country. Progressive federalists are also building the infrastructure and amassing the resources to compete in 2020. Groups such as the National Association of Nonpartisan Reformers, the Democracy Initiative, and Democracy Works are mobilizing new talent, technology, and resources to scale up solutions that are already working. California Forward is pushing for state-based reform through the “50 State Solution” pilot program, and New America is fostering an exchange of ideas through its Laboratories of Democracy project. Finally, the Unrig Summit in Nashville, Tennessee, in March will showcase major new efforts to expand the movement. Like the 2018 midterm elections, these stories and institutions reflect the electorate’s growing desire for democratic reforms, and that message is finally gaining attention at the national level. Along with health-care reform, a commitment to make government “more responsive, effective, and transparent” was the centerpiece of the Democrats’ message in the midterms. And now, the party is planning an early vote in the House of Representatives on a bill to establish nationwide automatic voter registration, restore key provisions to the federal Voting Rights Act, shift redistricting from state legislatures to independent commissions, and strengthen disclosure rules for campaign financing. These are all essential steps to revitalizing American democracy. Though the bill is unlikely to pass the Republican-controlled Senate, it will be a harbinger of the mounting power of progressive federalism in the years to come. Laura Tyson, a former chair of the US President's Council of Economic Advisers, is a professor at the Haas School of Business at the University of California, Berkeley, and a senior adviser at the Rock Creek Group. Lenny Mendonca, Chairman of New America, is Senior Partner Emeritus at McKinsey & Company. | Etiquetas: Amazon, Banks And Banking, Financial Technology, Jamie Dimon, Jeff Bezos, JP Morgan Chase and Co. The team explored the ways Amazon.com Inc. AMZN 5.01%▲ could muscle into financial services and where JPMorgan could fit in, according to people familiar with the matter. And what if, as Wall Street has long feared, the tech company were to become a bank itself? Industries from pharmaceuticals to logistics are grappling with the Amazon question, as the retailer relentlessly expands into new business areas. But in many ways, the online retail giant and the nation’s largest bank by assets have a special relationship. The fortunes of the two companies have become more entwined over the years. They are closely connected through a credit-card deal struck when the retailer was still mostly selling books and CDs on the internet. JPMorgan is in talks to partner with Amazon on a number of financial ventures, and the bank lends to the tech company. With Warren Buffett’s Berkshire Hathaway Inc.,the companies are working on a first-of-its kind venture to lower health-care costs for their hundreds of thousands of employees. Increasingly, JPMorgan has begun to emulate some of Amazon’s signature management practices. 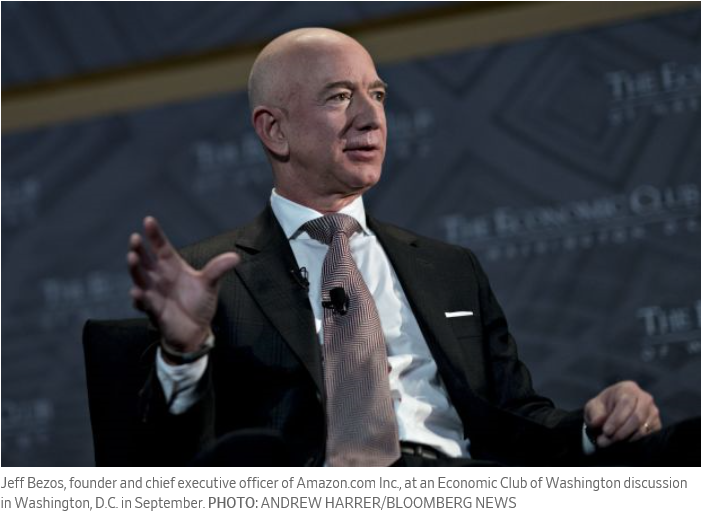 Mr. Dimon and Jeff Bezos, Amazon’s founder and CEO, have also become friendly over the past two decades, even as their business interests have at times been at odds, and despite some differences in their personal styles. 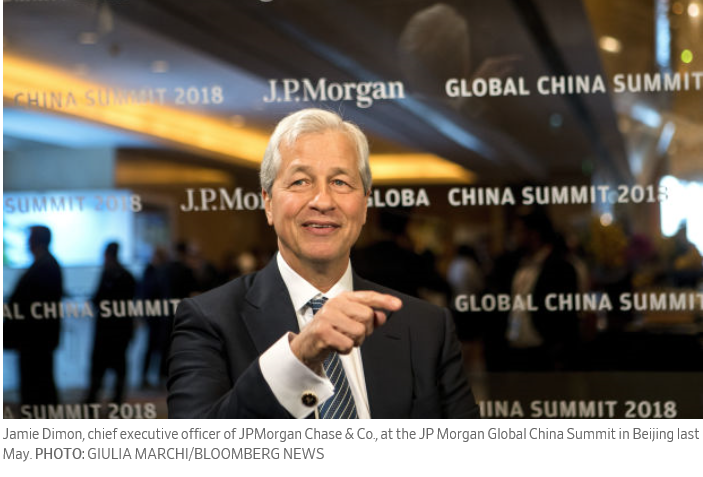 Mr. Dimon, 62, has spent most of his career in finance. At JPMorgan, he’s focused on maintaining a fortress balance sheet meant to protect the bank from big shocks. Detail-obsessed and focused on keeping costs in check, he often tucks a follow-up list in his pocket. Mr. Bezos, 54 years old, worked in finance at D.E. Shaw early in his career before founding Amazon in 1994. Mr. Bezos is an advocate of small, independent teams pursuing individual mandates, and emphasizes constant action and long-term thinking. He says his primary job each day as a senior executive is to make a small number of high-quality decisions. As the relationship between the men and their companies deepened, the balance of power shifted in Amazon’s favor. The retailer’s market value—at $770 billion—now dwarfs JPMorgan’s $335 billion. The bank, used to being the heavyweight in the room, is trying to figure out how Amazon fits into its world and how to avoid becoming its latest casualty. JPMorgan has adopted Mr. Bezos’s “Customer Obsession” mantra, which commands employees to start with the customer and work backwards when developing products and services, employees said. In September 2017, the bank hired Amazon executive Marbue Brown to oversee customer experience in its consumer bank and wealth-management business as part of its internal Customer Obsession initiative. Mr. Bezos notoriously banned slide presentations to keep Amazon in startup mode as it grew, instead asking employees to craft six-page documents complete with a press release and FAQs. 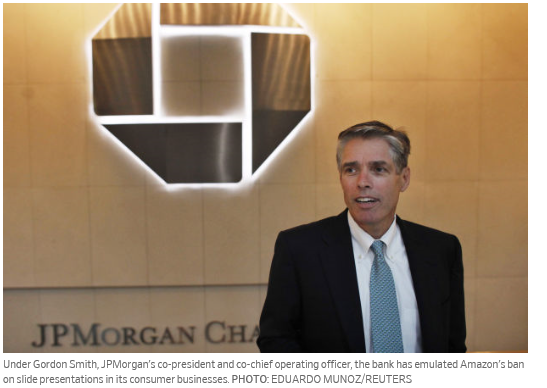 Over roughly the past 18 months, JPMorgan has started a similar practice in its consumer businesses under Gordon Smith, the bank’s co-president and co-chief operating officer, those employees said. 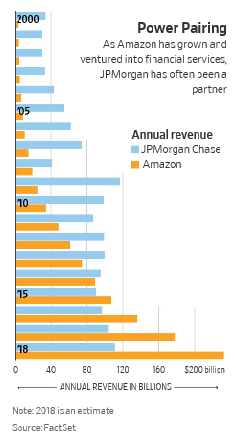 JPMorgan’s relationship with Amazon stretches back to at least 2002, when Chase began issuing the online retailer’s co-branded card. The deal predates Mr. Dimon, who joined JPMorgan in 2004. A few years earlier, Mr. Bezos had tried and failed to hire Mr. Dimon to be Amazon’s president. Mr. Dimon, recently fired from Citigroup Inc.by his mentor, Sanford “Sandy” Weill, flew to Seattle to have lunch with Mr. Bezos. Mr. Dimon has said it wasn’t the right time to make such a dramatic change. “I had this vision I’d never wear a suit again, I’d live in a houseboat like Tom Hanks” in the movie “Sleepless in Seattle,” Mr. Dimon told CNBC in July. Over the two decades that followed, Amazon’s sales exploded. So did its clout. About two years ago, when it came time to renegotiate the card agreement, Amazon was in a position to extract painful concessions. 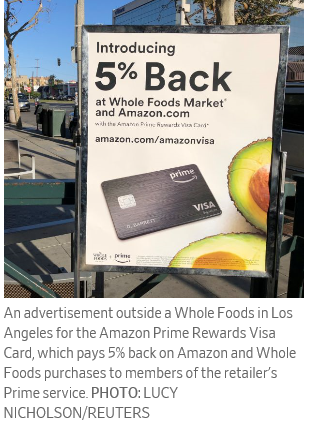 The Amazon Prime Rewards Visa Signature Card—one of two Amazon credit cards issued by JPMorgan—pays 5% cash back on Amazon purchases to members of the retailer’s Prime service (Whole Foods was added later). The bank agreed to share a far higher percentage of card revenue with Amazon than it had previously, according to people familiar with the matter. The bank’s executives knew the card wouldn’t be a big money-maker, and some internal projections even showed short-term losses on cards issued in the months following the deal, some of the people said. 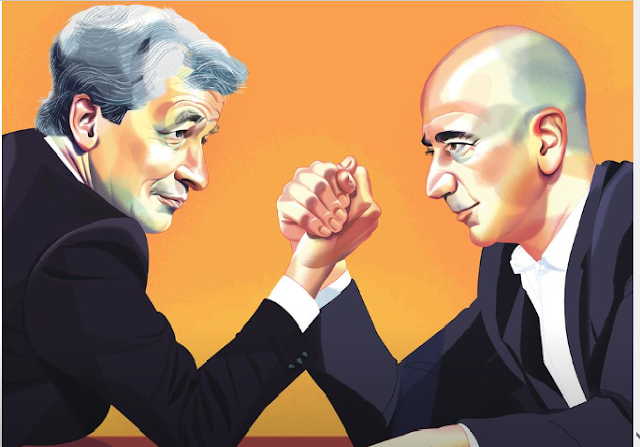 After a lengthy debate, Mr. Dimon signed off on the deal; the relationship with Amazon—one of JPMorgan’s top five corporate clients—was simply too important. The two companies worked closely to boost card spending, both on and off Amazon. A 2017 holiday-season spike in Amazon sales put the card closer to the red for JPMorgan. The card is currently profitable, people familiar with the matter said. Underlying these shifting power dynamics is the question of whether Amazon might someday make its own move into financial services. So far, Amazon largely has stayed off Wall Street’s heavily regulated turf, and it’s not currently plotting an entry into the banking business, people familiar with the matter said. Still, Mr. Bezos and other Amazon executives have long realized that financial services are key to the company’s success, in large part due to the company’s core online retailing business, according to people familiar with the matter. Early on, executives realized they were at a key disadvantage to brick-and-mortar rivals because merchants tend to pay lower fees on in-person credit-card purchases. For years, Amazon has worked to find ways to cut down on those fees, and executives have been focused on evolving the future of payments, making it as frictionless as possible, the people said. Mr. Bezos has stressed the importance of financial services and payments to some senior executives, according to some of the people. In 2017, it introduced Amazon Cash, which allows customers to load cash onto their account balance account at thousands of convenience, grocery and drug stores, as well as Coinstar kiosks. The move was seen as key to helping it acquire low-income and so-called underbanked consumers, who would otherwise have difficulty shopping on its site. It’s also been exploring the development of its AI-assistant Alexa to offer more payment options, like telling it to pay for gas at the pump or send money to a friend—something executives see as key to the way consumers will bank in the future, according to the people. And it’s loaned more than $3 billion to small businesses selling on its site via its Amazon Lending arm. Most importantly, the company has been building out Amazon Pay, its digital wallet that consumers use at outside merchants for payment on their sites. Amazon has quietly been trying to convince merchants to add it to brick-and-mortar locations, according to the people, something that could allow it to one day challenge Apple Pay. Amazon is looking to Asia, where mobile wallets like Alipay and WeChat Pay are commonly used. Amazon executives want to gobble up the U.S. market while the competition remains fairly minimal, according to the people. It’s part of a broader battle playing out between technology companies, including Amazon, Apple Inc.and Alphabet Inc.’sGoogle, to become bigger forces in consumer payments. Amazon’s efforts could result in new competition among these companies and could also be a challenge to PayPal Holdings Inc.’sVenmo and big banks that have been trying to boost usage of their own person-to-person payments service Zelle. While the balance has shifted in Amazon’s favor, JPMorgan has some things the tech company wants: an extensive payments infrastructure and a financial relationship with half of all U.S. households. In an on-stage interview last year at Southern Methodist University, Mr. Bezos was asked about business role models and pointed to Mr. Dimon. Amazon has partnered with the bank to expand Amazon Pay, which allows consumers to use the credit card or other payment option they have stored on their Amazon.com account to pay for purchases at non-Amazon merchants, joining ChaseNet, the bank’s own payments network under a years-old deal with Visa Inc.,according to people familiar with the agreement. Merchants that are a member of ChaseNet can also receive preferable pricing terms from Chase. That means, for instance, if a consumer shops with a merchant outside Amazon using a Chase credit card loaded into Amazon Pay, the merchant will pay lower transaction costs as long as it also uses Chase to clear its transactions. These types of perks are meant to encourage merchants to adopt Amazon’s wallet, one of the people said. JPMorgan also has been in talks with Amazon about building a checking-account-like product the online retailer could offer its customers, The Wall Street Journal reported in March. The service would build on Amazon Cash’s efforts to target younger customers and those without bank accounts. The lure for JPMorgan is access to Amazon’s enormous user base, including its tens of millions of U.S. Prime members. Amazon, meanwhile, wants to forge a deeper connection with customers who already use its platform to shop, read and stream videos. Regulatory queries have complicated the project, according to people familiar with the negotiations, and it’s unclear if it will materialize with JPMorgan or any other bank. Amazon’s virtual assistant, Alexa, is a sensitive spot in the relationship. 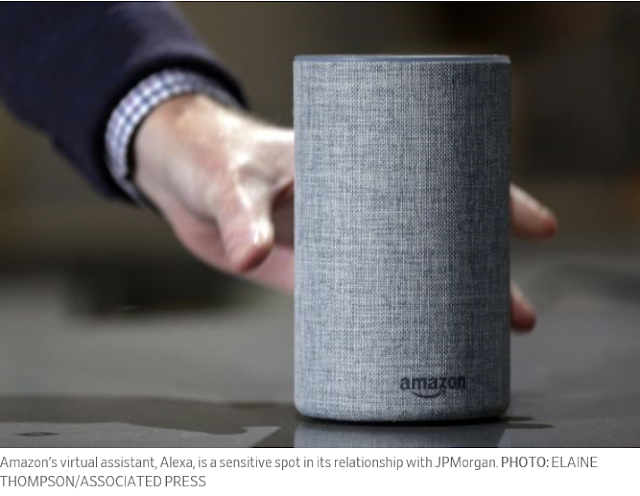 Capital One Financial Corp., American Express Co., US Bancorpand some other banks allow customers to access their financial information through Alexa, but privacy concerns have kept JPMorgan largely on the sidelines. JPMorgan began talking to Amazon about developing an Alexa voice application, or skill, related to retail banking customers a few years ago, but the discussions stalled last year, according to people familiar with the matter. Bank executives are concerned about how Amazon might use some of the data gathered from Alexa, which transcribes user conversations with the AI system, the people said. Amazon already allows certain developers to remove sensitive information from the Alexa app for things like voice passwords. The company has said it undertakes rigorous security reviews and encrypts communications for its devices and does not use the data to target ads or make product recommendations. Still, some recent Alexa mishaps have raised concerns. Last year, for example, an Echo device accidentally sent a recorded conversation to a user’s contact without permission. Amazon said at the time that, as unlikely as the event was, it was working to make it less likely.